New outreach to benefit more than 18,000 students. INDIANAPOLIS — Building Tomorrow, Inc., an Indianapolis-based social-profit enterprise has announced a new commitment to construct a total of 60 primary-level Building Tomorrow Academies in East Africa and to launch an initiative aimed at improving the quality of education in Ugandan communities by training over 450 current and future educators and developing a rural-relevant classroom curriculum. 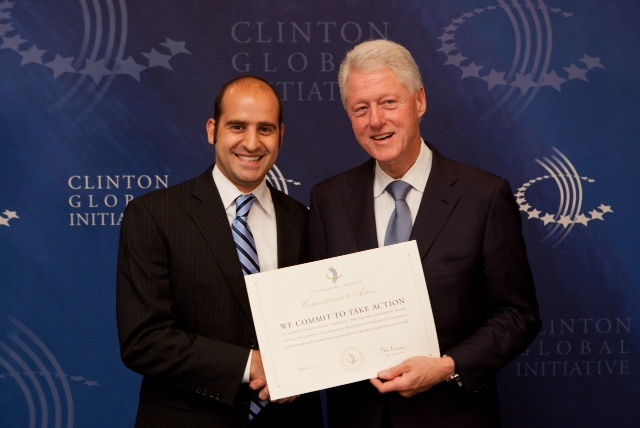 The commitment, announced at the 2011 Clinton Global Initiative (CGI) Annual Meeting in New York City runs through 2016 and will harness partnerships already built with student chapters at U.S. institutions including the University of Notre Dame, Indiana University and the University of Texas at Austin as well as the Ugandan Ministry of Education and Sports. In just under five years, Building Tomorrow has engaged thousands of students in the United States in service-learning, awareness, fundraising and design activities to support the construction of primary-level academies in Uganda. Today, Building Tomorrow counts seven open academies enrolling 1,500 underserved students with commitments for another ten to be constructed. Building Tomorrow’s unique cost-sharing approach means each donor community’s funds will be matched, in-kind, with the donation of land and approximately 20,000 hours of volunteer labor by each partnering Ugandan community. “While focusing on what happens inside the classroom is new territory for us, we know it is a matter of critical importance to our parents and, most of all, students,” Building Tomorrow Uganda Country Director Joseph Kaliisa said. For more information see Building Tomorrow’s Clinton Global Initiative Commitment. Building Tomorrow is an international social-profit organization encouraging philanthropy among young people by raising awareness and funds to build and support educational infrastructure projects for underserved children in sub-Saharan Africa. BT works with a college network of over 25 chapters nationwide and has a partnership with the 245,000 members-strong Key Club International, the world’s largest high school service organization. For more information, visit www.buildingtomorrow.org.